Summary: The Volusia County Environmental Management Division will purchase a professionally design and fabricated sea turtle ambassador costume. The sea turtle ambassador will add a fun new approach to sea turtle education and conservation in Volusia County. There is a growing awareness and excitement for sea turtle protection in this community, which is historically well known for its beach driving practices; the ambassador will further raise excitement and awareness by interacting with guests at educational events and programs. The ambassador will be on-site at Volusia County's Marine Science Center (MSC), an education, sea turtle and bird rehabilitation facility, for events such as the MSC Turtle Day, local sea turtle releases, summer camps and educational programs. Off-site educational appearances will include the local International Coastal Clean-up event, schools, summer camps, and environmental fairs. The ambassador will distribute educational materials during appearances. In conjunction with the development of the ambassador, staff will create two sea turtle focused computer "Prezi" presentations. Staff will use the first Prezi at establishments along the beach to train hospitality industry staff on environmentally responsible beach practices. The second Prezi will be designed to educate our many coastal visitors. The ambassador will be available for appearances at hospitality facilities that are interested in educating their guests about sea turtle conservation. Results: The sea turtle ambassador costume was delivered in early 2016. Costume Specialists was the company which designed and built our ambassador. A final photo of the costume is enclosed. 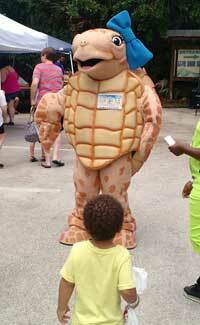 Our character is a female Loggerhead sea turtle with life like characteristics including colors and proportions. She has exaggerated female features including a bow, eyelashes, and light make-up accents. We named her after the scientific name for the Loggerhead, (Caretta caretta) which affectionately we call CC for short. The sea turtle license plate logo is prominently displayed on the front plastron (chest area) in a design element that resembles the look of a name tag. It includes the character name just below the license plate logo. CC has already made multiple appearances at the Marine Science Center including the largest event of the year, Turtle Day, which was held on April 23, 2016. She also was seen at the Florida Marine Turtle Permit Holder meeting in Jacksonville in February. In addition to the character and Prezi, we also created a coloring page that was used at the Turtle Day event. The Prezi presentations have been completed. Both presentations include information such as the basics of sea turtle and coastal wildlife biology, impacts of artificial lighting, best beach use practices (take only pictures, leave only footprints), local regulations, answers to commonly asked questions, and facts about commonly misunderstood information. As a warm-up, the resident and visitor version of the presentation was shown at the Lyonia Environmental Learning Center Wildlife event on Saturday, February 27, 2016.